To check how the university is integrating Intellectual Property (IP) regulations, the director general of the Intellectual Property Office of the Philippines (IPOPHL) personally visited the University of San Jose-Recoletos (USJ-R) on February 8. Atty. Josephine Rima-Santiago, IPOPHIL’s Director General, urged the university administrators to strengthen Intellectual Property (IP) integration into the researches of Josenians. Jesse Susada of the Center for Policy, Research, and Development Studies (CPRDS) said that the College of Engineering (COEng) is already on the forefront of the implementation of IP rights in its research papers. The university administration is already planning to expand it to the other colleges. IP rights may include copyrights, patents, and trademarks. When registered, an intangible property such as a concept or idea may only be of use to its proponent for a limited period of time as stipulated by law. IPOPHL is a government agency which is in-charge in the registration of IP and resolution of conflicts related to it. Their school visit is part of its regular assessment on the status of university-based research and innovation. 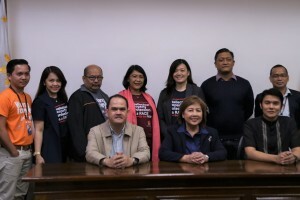 Director General Josephine Santiago (front, center) with VP Academics Rev. Fr. Leo Alaras, OAR, (front, right) and Dean Jeremiah Badana of the College of Engineering (front, left) take a commemorative photo with the IPOPHL team. The visiting team convened at the university’s main conference room with Rev. Fr. Leo Alaras, OAR, Vice President for Academics. More Josenian academic leaders were also present namely Dean Jeremiah Badana of the College of Engineering, Engr. Dennis Anthony Kilongkilong, and Susada. Fr. Alaras mentioned in the meeting that the University President aspires to make USJ-R a research university during his tenure. To achieve this, the CPRDS has been convening to come up with ways to further the students’ research papers. Meanwhile, Santiago also emphasized the need to stimulate the creativity of the students in coming up with studies that can help the society at large. The team reiterated that studies should not only gear for academic advancement but also prioritize social responsibility. Atty. Mary Grace Cruz-Yap, Director IV of IPOPHL Documentation, Information, and Technology Transfer Bureau, also brought up the cases of student’s research papers not being used. She underlined that there should not just be the creation and protection of intellectual property, but what is most important is its utilization. “These studies should not just remain on paper,” she said. Santiago also shared that they are doing this school-to-school visit because they are aiming to up the country’s Global Innovation Ranking, which is currently 73rd of 126 economies. They want to assert the importance of producing innovative research studies not just for the university, but also for the Philippines. IPOPHL is also gearing to offer a one week 36-unit program focused on understanding the aspects surrounding IP. The program is set to be ready next month, March, and is open to all who wish to learn more on the matters about Intellectual Property.